Treat them as if YOUR LIFE is riding on them! It is. 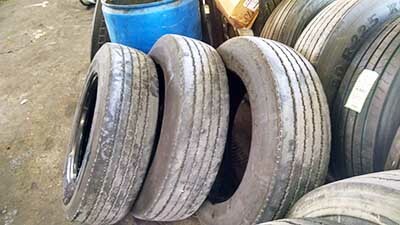 Whatever you drive or tow make sure that your tires are in good to excellent condition. That includes making sure they are properly inflated and aligned. 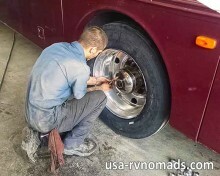 Use the proper tire; don’t assume the manufacturer used the proper ones, for often they opt to install RV tires that meet the minimum requirements at the lowest cost for them to increase their profitability. This puts you and your rig in jeopardy based on a standard they set as acceptable. Tires. If buying new or used from a dealer, ask for a tire upgrade as part of the deal. If that’s not, possible, factor the costs of replacing them into your negotiations. Then plan financially to have tires replaced post purchase … before you travel. 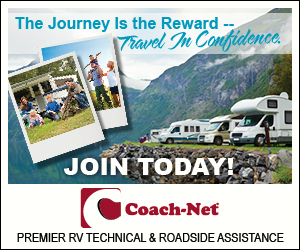 Some owners of brand new RVs (mostly Travel Trailers and 5th Wheels) have found out within a couple hundred miles that the tires were not suitable and the situation created was none too enjoyable. When we purchased our used motorhome, it was fast approaching its 10th year, and still wearing its original tires. Outwardly they appeared to be fine, but as we added miles…some 10,000 miles in the past year, we began to experience tire related vibrations on the front axle. This vibration initially was thought to be caused by an alignment issue as the tread wear on one of the tires indicated. A visit to an alignment shop told us otherwise; the alignment was fine so it pointed to the tire(s) as the source for the vibration. We proceeded on our journey, but on one particular leg it was very apparent we could not wait any longer to at least replace the tires on the front axle. I shopped around trying to find who offered the best overall deal. Most would just compare prices on tires, but you also have to take into consideration the other costs associated with replacing a tire. Mounting, balancing, disposal of old tires and taxes…state and federal. All these add to the cost of the tire(s). You may get a great deal on the price of the tire, but they rake you over the coals on everything else, so it pays to shop around looking at the TOTAL cost of the purchase, not just the item itself. The new front tires really made a huge difference! It was strange not feeling the vibration as we drove down the road. The change was so dramatic that it was apparent just a few blocks away from the tire shop. A couple weeks later we replaced the four on the rear. Again, the ride improved and just watching the fuel consumption for the short trip to our next stop showed a fuel savings from slightly higher MPG. Inspection of the old tires revealed nothing, except those off the front which one had some pretty good wear. This came from the tire losing its round and becoming egg shaped. The vibration it was introducing to the steer axle was starting to cause the opposite tire to wear as well. When the rear wheels were removed, one of the inside dually had a wheel weight partially off and signs that it had thrown another one. That probably explained a loud thunk we heard one day while traveling. This meant that the tire and wheel were no longer in balance which could cause the wheel to bounce, again forcing it to wear unevenly and increase vibration and noise levels. One would think that a ten year old tire that toted around as much weight as our motorhome weighs would show some signs of aging…other than tread depth which is normal wear. Nope, not a blemish. No cracking along the sidewalks, no indications of tread starting to separate from the carcass. Internally, they looked just the same as the new ones they were replaced with. It’s about this time that you start to second guess your decision to buy these very pricey new tires. You watch as the technician gets ready to start the process of mounting and balancing the new tires, thinking, hey these look fine, let’s just remount and balance them…they’ll be fine for a while longer. Well, don’t let that thought turn into words exiting your lips. Catastrophes happen, and true you may be able to drive another mile, day, week, month or even years on those old tires, but the odds are really stacking up against you that something WILL happen. 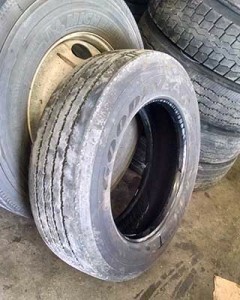 Think what happens when one tire blows, the load now is supported by the adjacent tire and if that tire is in a similarly worn and aged state, it too will fail causing greater potential for damage, cost of repairs/replacement and a huge inconvenience. Murphy’s Law, let it happen where and when it’s the least favorable to those involved. 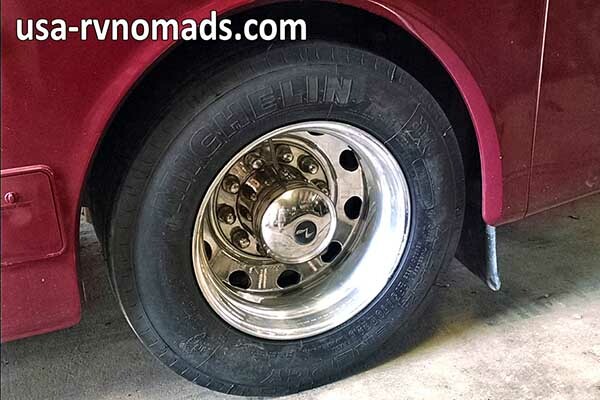 Let’s not forget…injury or even someone’s death could be a result of an accident due to an RV tire failure. With the new tires, our confidence in our safety is high. The ride is more enjoyable and the worry that the next pothole or bump might cause a tire to blow is gone. You can bet I will remain vigilant watching the roadway for obstructions and debris…but the tension felt after a long day behind the wheel will have eased significantly. Wheel & Tire Covers..Yes or No? If parked for several days in one spot, especially where there is a lot of direct sunlight, go ahead and put them on. But, wait until the next morning before putting them on. This will give the tires ample time to cool down after a long trip. Be sure to give each tire a good visual inspection before covering them too. 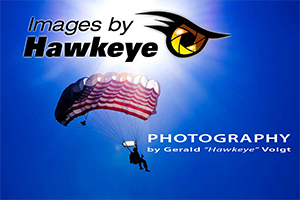 Find any issues as far in advance of your departure as possible.